Home News Could Legal Marijuana Lead to More Border Arrests? Could Legal Marijuana Lead to More Border Arrests? Before marijuana became legal nationwide in Canada on Oct. 17, speculation swirled about what the new industry would mean for the 5,500-mile-long border with the United States. U.S. authorities maintain that Canada’s new marijuana policy does not alter anything for border enforcement. Marijuana is not going to be a routine question for all travelers, though it may come up. Transporting it to the United States in any amount is illegal, just as it was before. “Nothing has changed on the U.S. side post legalization,” CBP spokesperson Stephanie Malin said in an email in late October. But immigration and civil rights experts who follow the border are skeptical. “I think it’s a little more complicated than that,” said Scott Railton, an attorney with Cascadia Cross-Border Law in Washington. The contrast between the two countries’ marijuana laws opens the possibility of stricter control along a border that has already shifted toward heightened levels of scrutiny and security over the past few decades. And confusion about who is legally admissible to the United States, as well as the widespread availability of marijuana to adults in Canada, could give authorities more reason to conduct searches. Confusion about who is legally admissible to the United States could give authorities more reason to conduct searches. The boundary between the U.S. and Canada is sometimes portrayed as almost comically quaint, with the two neighbors separated by a row of potted petunias. In fact, the dynamic along the northern border has undergone a transformation over the past few decades. Security sharply increased along the boundary after Sept. 11, 2001. New policies put in place about a decade ago imposed stricter requirements for travelers to present a passport or an enhanced driver’s license. Residents of border towns that once operated as one and the same with their neighbors across the line complain of burdensome checkpoints that stem the flow of cross-border traffic. Technically, the United States isn’t actually altering any policies in the face of Canadian legalization, just applying what’s already on the books. The fact that a substance the United States classifies as dangerous and having no medical use just became legal for Canadians to sell and consume has put a spotlight on how they will be impacted by some aspects of American law. There are, according to Railton, nine different cannabis-related statutory bases for U.S. border officers to find a non–U.S. citizen inadmissible. American border officers can ban non–U.S. citizens who admit to having used marijuana, even where it is legal for them to consume it, under a law that allows authorities to turn away people who say they have used a controlled substance. The Los Angeles Times reported in October that a Canadian medical-marijuana user was barred from entering the country after he told officials that he has used the substance.The policy has Canadians concerned about how they should handle questions about cannabis use at the border. The mayor of one Saskatchewan city said he is aware of some residents who have been turned away from the U.S. because they’ve admitted to instances of decades-old marijuana use. Not only does this impact people who wish to visit the U.S.—it has implications for visa- and green card–holders, according to immigration experts. U.S. policies also heighten risks of cross-border travel for Canadians who work or invest in the country’s legalized marijuana industry. Noncitizens can be banned from the United States on the grounds that they are involved in drug trafficking. U.S. officials have tried to clarify the situation, saying that for Canadians who work or invest in the marijuana industry, traveling to the U.S. on business related to the pot industry could get them blocked. Officials say, though, they shouldn’t have trouble at the border if they’re coming across for a reason not related to the business. But, Railton said, some border officers act in a “quasi-judicial” fashion that will leave them to make judgment calls on the spot about how to apply the law in murkier cases. American authorities’ strict approach to marijuana is in place despite the fact that adult recreational pot is legal in 10 jurisdictions in the United States, including four states that border Canada—Alaska, Washington, Vermont, and Maine. A fifth border state, Michigan, is on track to legalize after voters passed a ballot measure Tuesday. But even if legalization is in place in the state someone is traveling to, those policies are irrelevant at the border. Marijuana remains a banned substance at the federal level, and U.S. border officials enforce it that way. Some—like immigration attorney Matthew Kolken, based in Buffalo, New York—are expecting to see a rise in the number of cases involving people found to be carrying marijuana across the border. That can be punishable by civil fines or, as in at least one case already, federal criminal prosecution. Less than two weeks after legalization took effect in Canada, 23-year-old New Yorker David Dratch was arrested while trying to re-enter the U.S., allegedly bringing half a dozen envelopes of marijuana, some resin, and an assortment of THC-infused gummy worms. He’s facing charges that could carry a fine of $250,000 and up to five years in prison, according to the Department of Justice. Early this week, border authorities in Montana announced that two U.S. citizens who were carrying marijuana, hash oil, and a pipe at a border crossing had been turned over to the county sheriff for prosecution, according to KRTV. Kolken anticipates that questioning about marijuana will become more common at the border. “I think it’s going to be at the forefront of the inquiries that are being made, especially if there’s potentially paraphernalia in the car,” he said. Some advocates worry that the new Canadian system may create headaches away from the border as well. SangYeob Kim, an immigration legal fellow at the American Civil Liberties Union of New Hampshire, has concerns that Canada’s new marijuana laws may motivate Border Patrol to set up more interior checkpoints. Border Patrol has broad authority to conduct warrantless searches as far as 100 miles from the border, sometimes setting up checkpoints along roadways considerable distances from the line. While the stated objective may be to crack down on drug trafficking, Kim said, the operations often end up mostly targeting people who are undocumented. Now, those carrying marijuana could potentially be targeted as well. 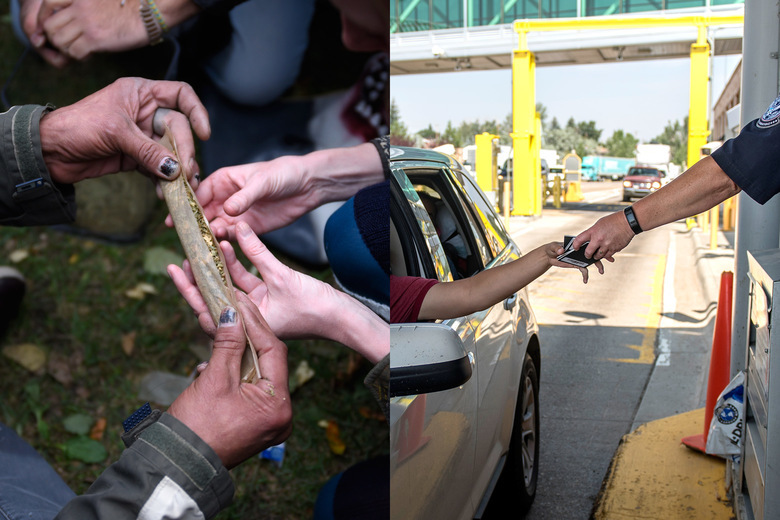 In the first few weeks after the new Canadian system was implemented, there had not been an apparent boom in border problems related to marijuana. One of the main concerns voiced before legalization took effect, that it would lead to longer wait times because of increased searches at U.S. entry points, does not appear to have come to fruition, Railton noted. Wait times, according to the CBP website, have remained steady. Legalization is still new, though. The potential for conflict between the two countries’ policies looms, and U.S. border officials have the power to crack down on non–U.S. nationals involved with what is a legal industry in their home country.